Address: children Hospital, Ferozpur road. Please be courteous to donors who are unable to donate. Blood donation never decrease you strength and you recover same level of blood in few days. There is no substitute for human blood, its very rare and important thing for saving life. 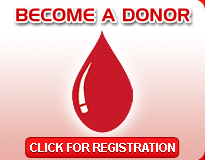 Donate blood and share life.